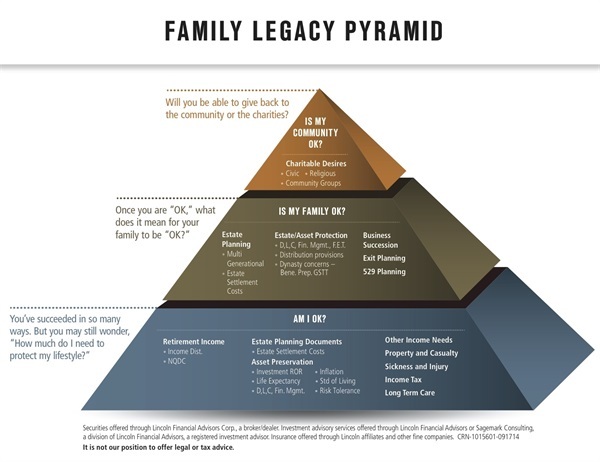 At Plan For Tomorrow, we often use a three-tiered Family Legacy Pyramid to help clients address a myriad of needs and concerns. The first level is the most critical. Serving as the foundation of a solid financial strategy, it addresses the essentials of a solid financial strategy, such as the creation of wills and trusts, building a portfolio that mitigates risk, and ensuring the client can maintain their current lifestyle in retirement without outliving their assets. The second level addresses concerns that clients transitioning into retirement often face, such as ensuring that their family will be protected. This may include college funding for a child or grandchild, business succession, estate / asset protection planning. If a client surpasses these two phases, they may reach the third level, which entails charitable giving and legacy planning. During this phase, we help them identify any charitable causes or groups they may want to financially support.